We were talking on board today about the olden days, you know, when Jaques Cousteau and Marlin Perkins could reliably be found on a majority of American televisions. Remember Generation X? 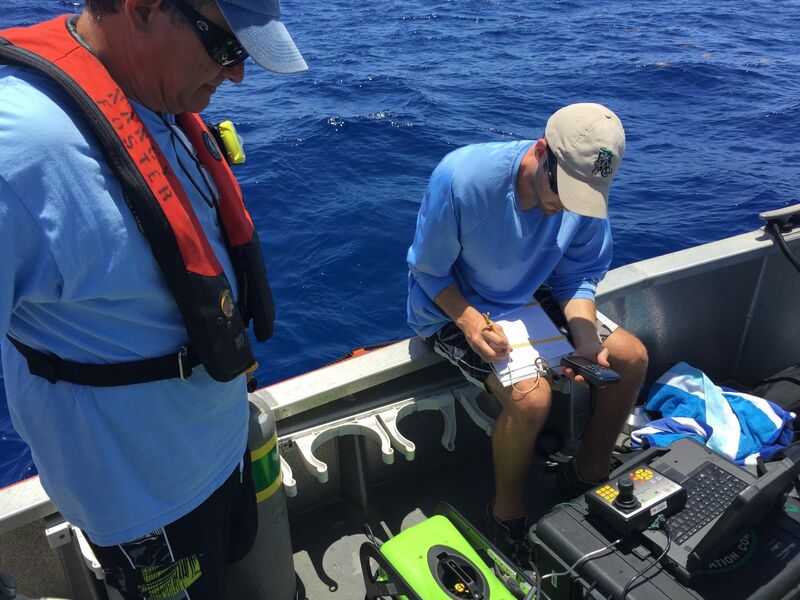 Jeff from FWC at the controls of the ROV searching for signs of spawning aggregations. Yes- we are in our 40s now. Kids my age had the spirit of scientific adventure to look forward to on Sunday nights. The same generation of kids grew up with monitors and joysticks, interacting with worlds that were somewhere beyond the “real world” on our Ataris and Commodore computers. Our 1980s parents might be incredulous to learn that we are now doing these same things to investigate critical habitat, monitor fish populations, and gather geographic data. I know many futurists predicted it would happen but the grownups I knew were skeptical, to say the least. The remotely operated vehicle has been a staple of marine research for many years now. Called an ROV for short, these devices are human operated machines that can do many of the same things humans divers can do but in much more difficult circumstances, for much longer periods of time, and at greater depths. ROVs are “employed” by resource managers, marine scientists, construction crews, engineering companies, and just about anyone else who has work to do under water. Loading ROV gear into dive boat. We have been using an ROV on our current mission on the Nancy Foster to collect fisheries data. With the ROV we can investigate different areas identified on hydrographic maps and from previous studies without labor intensive dive operations. The ROV does not need to stick to a dive schedule and as long as it has power and a willing operator, it can do its job. The ROV has several components that must all be brought onto our dive boat in order to operate. The primary need of the ROV is electricity. Rather than running on combustion or cellular respiration, which both require oxygen, the ROV needs a steady supply of electrical current. 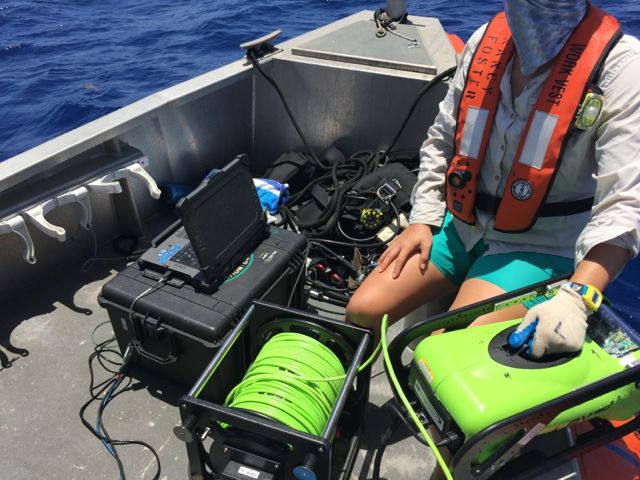 Because many variables can affect the power demands of an ROV such as speed, depth, wind, and current, the FWC team has chosen to operate a small generator to power their ROV. ROV being set up for deployment. Note the spool of tether cable and control panel. The ROV has a specialized cable that carries the electricity from the boat to the motors. This cable, called a tether, also carries the signal from the controller to the motors to tell the ROV where to go. The video input the ROV gathers is relayed through this cable in order to allow the operator to see through the “eyes” of the ROV, and, of course, record what it sees. Operating the ROV requires a good deal of coordination. The craft is controlled much like a slow, unresponsive airplane. It can move forward, reverse, side to side, up and down, and operate at a tilt. 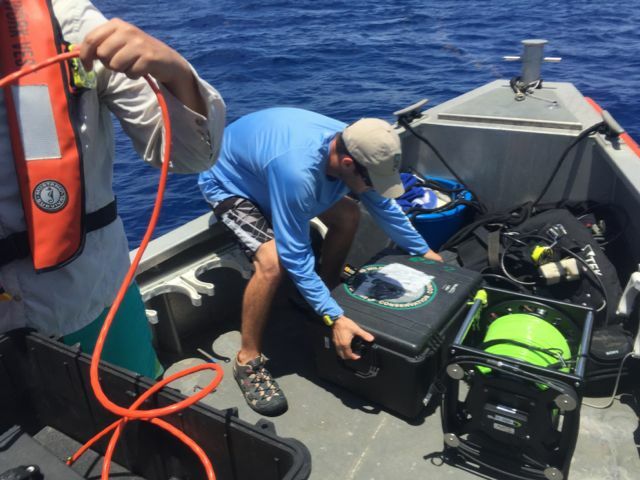 This dizzying array of motions are necessary to track and study the reef fish as they travel through the Florida Keys National Marine Sanctuary. Jeff Renchen of the Florida Fish and Wildlife Conservation Commission (FWC) is, among many other things, our ROV operator on this cruise. He is using the small ROV to collect data on spawning aggregations of several important fish species. Jeff explained that the ROV allows researchers to explore deeper than divers are able to easily go. ROV camera operations can follow aggregations of fish and provide insights into the behaviors and conditions of spawning fish, as well as structures and locations that are important for spawning behavior. With the ROV in the water Jeff takes it for a swim away from the boat. 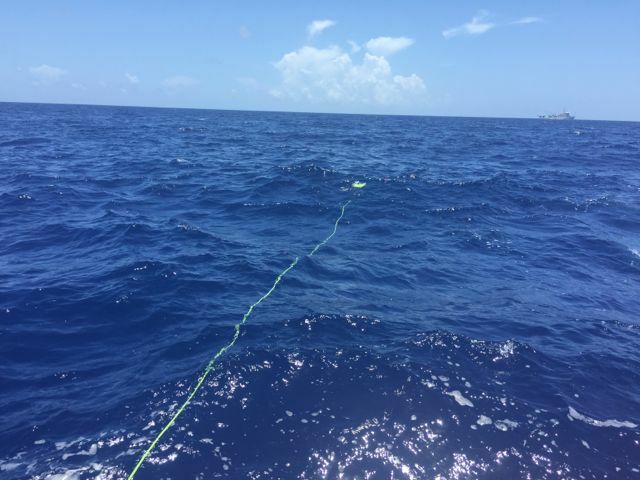 Once the ROV’s line has 50 feet of slack, the tether is attached to a drop line. 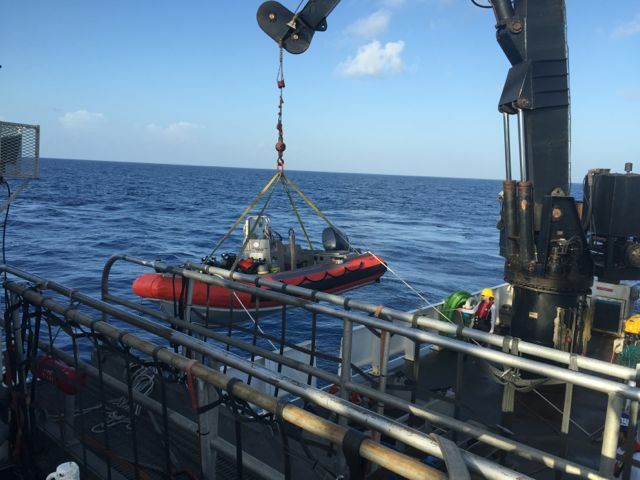 In strong currents, it is possible for smaller ROVs, like the one here, to get carried off. The drop line allows us to raise or lower the ROV in the water column faster, increasing our ability to focus in on fish of interest or specific depths. There are some things that seem special no matter how many times you have seem them before. I remember a long time student of Appalachian ecology saying that he could not remember what he had for lunch but he could describe every time he had seen a bear. There are some things in our world that have that the ability to mesmerize us, silencing the combating thoughts that often clutter our minds and setting a reset button somewhere in our brain stem. One of those things that stands out for me, and kindly keep it to yourself if you disagree, is seeing dolphins interact. We came in from some drop camera operations on Wednesday evening and found this pod of dolphins playing in the wash of the Z-Drive motors of the Nancy Foster. There would more footage but if you are taking video rather than living in this moment, you are probably doing it wrong. Watching dolphins play and interact appeals to so many of us. I think it reminds us of the pleasure of physicality and the joy that can be had as social creatures. 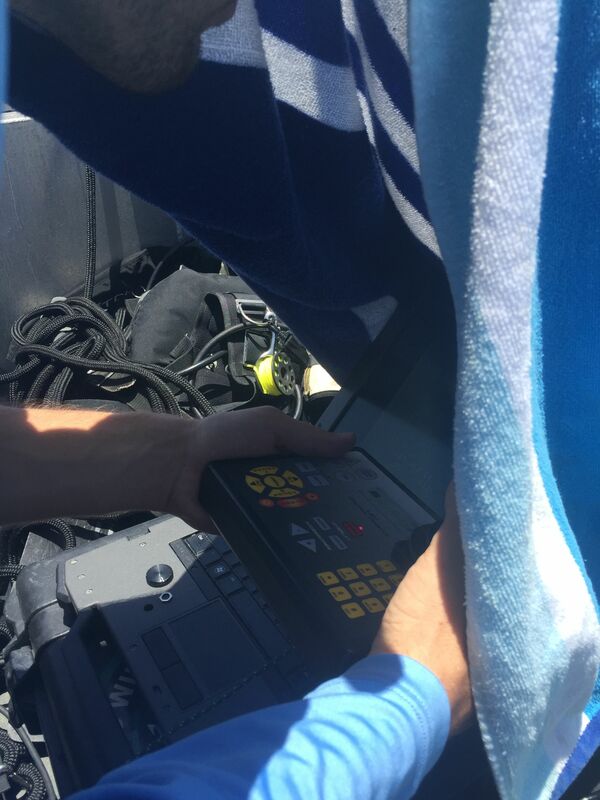 Then there is the thrill of hearing “There’s a shark” from the scientist monitoring the camera you have been steadily lowering below a 17 foot dive boat bobbing in the small but steady waves. 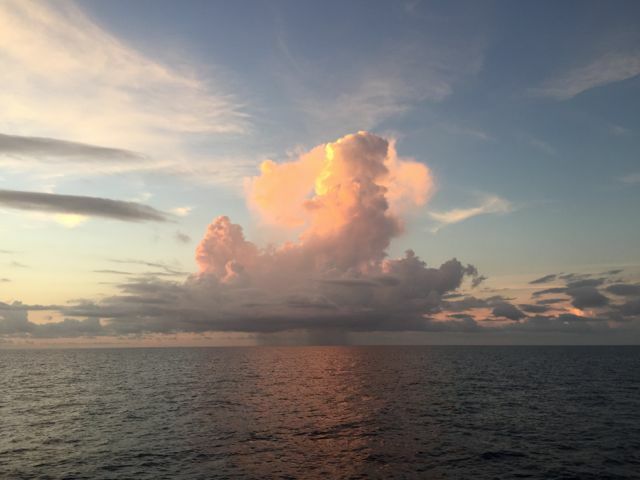 The enormities of life at sea give us an awe inspiring sense of scale. Every day at sea there is at least one endless horizon and yesterday they surrounded us on all sides. Just past sunset I caught this small cumulonimbus that had previously drizzled on our afternoon drop camera trip. I thought about the thermal energy required to make such a structure. I wondered at the amount of fresh water it carried. And then my brain quieted down and I just watched it. Cumulonimbus with 2 layers of rain. This entry was posted in 2015, National Marine Sanctuary, NOAA Ocean Service, NOAA Teacher at Sea, William Henske and tagged dolphin behavior, fisheries data, Jaques Cousteau, life at sea, Remotely Operated Vehicle, spawning aggregations, video input. Bookmark the permalink. It really is great to get an inside look into the research and I know this will be a great experience to share with your students as they prepare for Dauphin Island. Looking forward to your next post! Thanks Scott. It is also amazing to see the difference a few hundred miles of latitude can make.